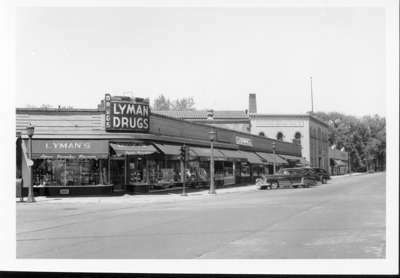 Lyman Drugs northwest corner of Wilmette and Central Avenues, Wilmette, Illinois, 1948. View looks east down Wilmette Avenue. Also visible in the photograph is Encyclopedia Britannica Films, Jewel and a dry goods store. The photographer's stamp is on the reverse of the photograph. Photo by Bill Kuiken, 1337 Washington Ave., Wilmette, Ill.